Haute Horlogerie from the "Land of the Rising Sun"
The Japanese manufacturer Seiko drives innovation in the watch industry. Their catalog features everything from affordable quartz watches to masterpieces with minute repeaters. They produce all of their own components, without any external suppliers. Over the course of its history, Seiko has brought numerous innovations to the market. Some of the most prominent include one of the first automatic chronographs in the world, the highly-efficient magic lever system, and the hybrid Spring Drive movement, in which a quartz crystal replaces the traditional lever escapement. These pioneering innovations are featured in the Grand Seiko luxury watch collection. The Tokyo-based manufacturer introduced this flagship collection in 1960, and it remains home to some of the best mechanical wristwatches in the world. Only a few Grand Seiko watches are produced each year. The designs are streamlined, elegant, and yet radiate a sense of sportiness. 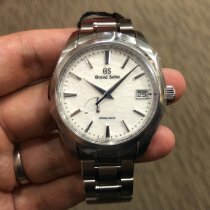 Today you can purchase a pre-owned, self-winding Grand Seiko for approximately 3,500 euros. Unworn models start at 4,900 euros. The horological masterpieces found in the Credor series are true examples of haute horologerie. This collection proves that highly complicated watches with a minute repeater or tourbillon are also made in Japan. 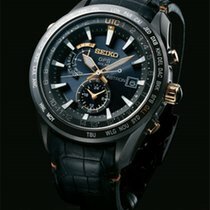 In addition to luxury watches, Seiko has many quartz watches in its catalog. They were the first manufacturer in the world to make battery-powered wristwatches, starting at the end of 1969. The Quartz Astron's deviation was only about one minute per year — a significant achievement at the time. Today, watches in the Astron collection are high-tech timepieces with a GPS module and solar cells, which charge the integrated battery using light. The quartz movement automatically sets the time via the GPS receiver and, therefore, never deviates from the current local time. The newest wristwatches in this Seiko collection take 40 time zones into account and also have a perpetual calendar that won't need to be adjusted until February 28, 2100. How much does a watch from Seiko cost? Seiko manufactures wristwatches with outstanding value for money in every price range. Their catalog ranges from affordable quartz watches, which cost less than 100 euros, to luxury watches from the Grand Seiko collection, which can cost upwards of 10,000 euros. The automatic diving watch Grand Seiko Hi-Beat 3600 Professional 600m with reference number SBGH255 costs around 10,000 euros. It is waterproof to 600 m (60 bar) and has a titanium case. The in-house caliber 9S85 ticks away inside this nearly 47-mm watch and has a maximum deviation of +5 or -3 seconds per day. A special feature of this movement is its high balance frequency of 36,000 vibrations per hour (A/h), guaranteeing the best accuracy. Despite this high frequency, the caliber 9S85 still has a power reserve of 55 hours. At Baselworld 2017, Seiko presented a classic retro dress watch that looks similar to the first Grand Seiko from 1960. The remake of this classic luxury watch is available in stainless steel (SBGW253), yellow gold (SBGW252), or platinum (SBGW251). The watch has grown to a contemporary 38 mm diameter as opposed to the original model, which was 35 mm. The manual caliber 9S64 also meets today's quality standards and offers a power reserve of 72 hours – enough energy to last a weekend. A special feature of the platinum model is the movement's regulator. Thanks to its fine-tuning, the watch deviates a maximum of +5 or -1 seconds per day. Other models have a maximum deviation of -3 seconds per day. The platinum version is limited to 136 pieces and is currently listed around 38,500 euros. The 353 yellow gold pieces cost 21,700 euros each, and you can get one of the 1960 stainless steel watches for 7,200 euros. You can find sports watches for professionals at affordable prices in the Prospex Collection. The collection's name is derived from "Professional Specifications," which illustrates that this series is comprised of watches for professional purposes. A majority of the models can be purchased for around 500 euros. 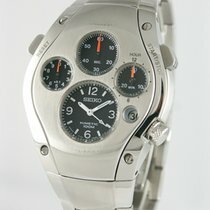 However, top watches like the 2000-piece limited edition Retro Diving Watch Seiko Prospex SLA017 can cost 3,600 euros. The SLA017 is yet another highlight presented by Seiko at Baselworld 2017. The timepiece's design is reminiscent of the first professional Japanese diving watch debuted in 1965. Connoisseurs refer to this watch with reference number 6217-8000/1 as the 62MAS. The acronym 62MAS stands for "autoMAtic Selfdater", or rather an automatic watch with a date display. The new 40-mm Seiko diving watch is almost 3 mm larger than the original model. When it comes to design, it is hard to tell the difference, however. The words "200 m" on the dial are the only mark that reveals one is looking at an SLA017. 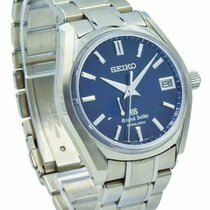 Needless to say, Seiko uses sapphire glass in the modern watch rather than the plastic of the former model. The SLA017 is driven by the caliber 8L35, which is based on the caliber 9S55 from the Grand Seiko collection. The 8L35 is optimized for diving and is also used in the Marinemaster Professional 300 m, which can be purchased for 2,000 euros. Alternative retro-design watches have the reference numbers SPB053 and SPB051. These feature the less precise and more affordable automatic movement 6R15. Both models are available for around 1,000 euros. In addition to automatic diving watches, you can also find highly-functional quartz watches with solar cells, radio reception, and stopwatch or world time functions in the Prospex collection. One highlight is the series of GMT kinetic watches, which feature hybrid technology that turns kinetic energy into electrical energy for charging the battery. Similar to a conventional quartz watch, a quartz crystal is responsible for the high frequency level. You can buy a Prospex Kinetic GMT Diver's under reference number SUN019P1 for around 500 euros. If you're looking for an affordable self-winding watch, look no further than the Seiko 5 collection. Prices for these well-made timepieces begin around 80 euros for a three-hand watch with a day-date display. The design of these low-priced watches is sleek and sporty and is therefore perfect for wearing every day. Some varieties may remind you of pilot or military watches due to their dials and textile straps. For example, reference number SNK805K2 has an olive-colored strap and dial. Due to their affordable prices, many watch enthusiasts ask themselves: How good can Seiko's movements really be? Generally speaking, the calibers used in the 5 collection are manufactured on a large scale and are considered to be low-maintenance workhorses. Movements from the 7S-family with three hands and a day-date display are often used. With a daily deviation of -15 to +25 seconds, these are no chronometers. However, they are still quite accurate. Hardly any other manufacturer offers such good value for money. The "most expensive" watches from the Seiko 5 collection cost less than 500 euros. The collection's top models have bi-color cases and straps and cost around 200 euros. 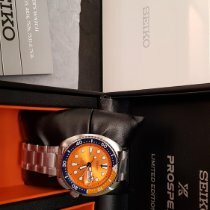 If you're looking to spend more than 200 euros, you could buy the popular Seiko Automatic Diver's with a rubber strap (SKX007K1) or metal bracelet (SKX007K2). Current models are waterproof to 200 m (20 bar), have a unidirectional bezel, and luminous hands and hour markers. Thus, they are very affordable diving watches that have similar functionality to markedly more expensive Swiss watches. Every watch in the Presage collection has a mechanical movement. In terms of design, Seiko relies on classically elegant elements so that the watches will complement any business outfit. Prices for new models begin just over 250 euros for a three-hand watch with a day-date display, and go up to around 2,800 euros for a limited edition chronograph with an automatic caliber. The latter was created by Seiko in 2016 to celebrate the 60th anniversary of their first automatic watch. The Japanese manufacturer uses the caliber 8R48 with an intermediate wheel in these watches. There are only 1,000 pieces available of each of the two limited edition versions with the reference numbers SRQ021J1 and SRQ023J1. The model with reference number SARX019J is the ideal watch for classic dress watch enthusiasts. This timepiece with three hands and a date display has Roman numerals to mark the hours on the enamel dial and leaf-shaped hands. A strap made of crocodile leather and a fold-over clasp with a safety mechanism keep this stainless steel watch securely on your wrist. The caliber 6R15 ticks away inside this watch, which costs around 1,000 euros and has a power reserve of around 50 hours. In the Premier collection, Seiko has taken classic design elements and given them a modern twist. Roman numerals are used to mark the hours in the majority of this collection's watches. The two-tone design of many of the cases and bracelets also underlines the traditional look of these watches. Modern features include diameters of 41 mm or even 43 mm, as well as wide bezels and bands. The Japanese manufacturer predominantly uses quartz calibers to power these watches, though some also have kinetic movements. 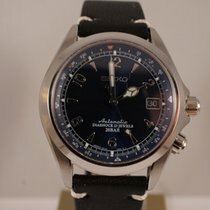 You can get pre-owned Premier watches in good condition for around 200 euros and in mint condition starting around 250 euros. The top models in this collection have a kinetic caliber with a perpetual calendar and automatic leap year correction, as well as a power reserve of up to four years. Rose gold models cost around 700 euros and those without gold plating cost around 600 euros. The Sportura and Velatura collections mostly feature quartz watches with striking, sporty looks. Many models in the Sportura collection use solar power to charge their batteries. The watch with reference number SSC357P1 includes complications such as a perpetual calendar, a chronograph, and an alarm. This 45-mm timepiece with a tachymeter scale on the bezel is made of stainless steel and is waterproof to 100 m (10 bar). The price for this multi-functional watch is around 330 euros. Those who want a Seiko watch with eco-friendly kinetic technology should look at the Kinetic GMT with reference number SUN015P1, which costs around 400 euros. The highlight of this collection is the GPS Solar World Time with reference number SSF005J1. Its 45-mm stainless steel case has especially resilient titanium plating. As for functionality, it has a perpetual calendar as well as daylight savings and world time complications. The integrated GPS module takes care of the local time and timezone. To purchase a black timepiece, you should expect to spend around 1,200 euros. Watches from the Velatura series have a maritime design and are geared toward sailing enthusiasts. Thus, these models have countdown and chronograph complications for timekeeping before and during regattas. Since most of the watches in this collection are powered by quartz movements, all of the timepieces are comparatively affordable. You can find a pre-owned Seiko Ventura for around 250 euros, or 300 euros for a watch in very good condition. The prices for mint-condition quartz watches from this collection begin around 400 euros. New Yachting Timer pieces, which feature a countdown complication for timing regattas, are in the same price range. You can buy a kinetic Velatura starting around 500 euros. Kintaro Hattori first opened a small clock store in his early twenties in 1881, creating the foundation of today's Seiko corporation. The first factory followed only 11 years later and had the name "Seikosha". This term comes from the Japanese words "Seiko" (precise) and "sha" (house). The goal was to manufacture all of their own components and to sell watches at more affordable prices than their competitors. The concept was a triumph and has brought the company long-lasting success. Today, they produce almost all of their own watch components — a unique trait in the world of watchmaking. When Seiko introduced the first Japanese wristwatch "Laurel" to the public in 1913, every single component had been made in-house. Prior to that, they had manufactured pocket watches and wall clocks. Current president Shinji Hattori is the fourth generation to head the corporation, which also includes brands such as Orient Watch, Pulsar, and Lorus.